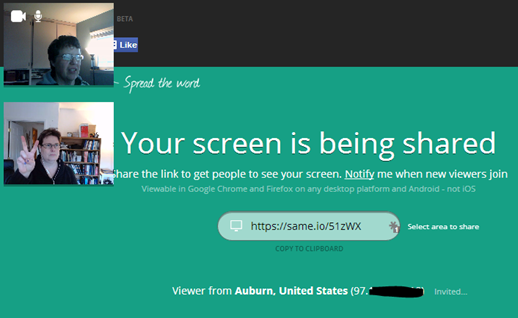 As readers of my blog know, I’ve been a big fan of Join.me for screen sharing. 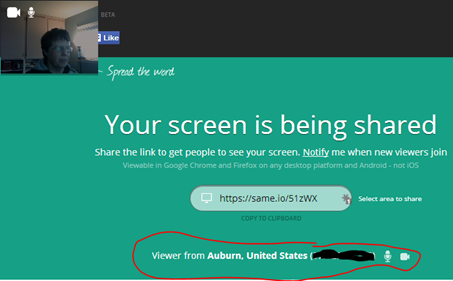 While Same.io doesn’t allow others to control your screen like Join.me does (yet? ), Same.io does have video conferencing. Let’s take a look at how Same.io works. In the center of the screen with be the URL you can share with whomever you’d like. 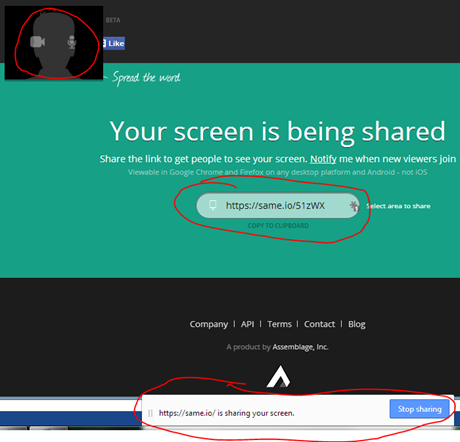 As long as you’re in screen sharing mode, this URL will connect whoever has the URL to your computer screen. At the very bottom of the screen, you can see that Same.io is sharing your screen. When you’re done, click the blue “Stop sharing” button. If you just want to communicate via microphone, click the mic icon in the top left corner of the screen. If you want to communicate with both audio and video, click the camera icon. Here you can see I’ve turned my webcam on. Clicking the microphone icon will mute the mic. Clicking the camera icon will ‘mute’ the camera. At the bottom of the page, you can see that I have someone who has accepted my invitation. The location is determined by IP address. Don’t be surprised if it’s not where the person actually is. It should be close, though. To the right of the location is the IP address. Now I can invite my collaborator to share their microphone (by clicking their mic icon) or both their mic and camera (by clicking their camera icon). When the person accepts, their webcam image shows directly below mine. In all of these screenshots, I have the Same.io webpage up on my screen. I could have switched to my Word document, my email, a spreadsheet, or even just my desktop. Whatever I see on my screen is what others will see on their screen. Important note: If you have dual monitors, both monitors will be seen by those with whom you are sharing your screen. The URL is a one-time use only URL. After I stopped sharing my screen, this URL no longer worked. The next time I share, Same.io will generate a new URL. If you upgrade ($9.99/month or $99.99/year), you will get your own custom URL and the ability to password protect it. In other words, I could send people to same.io/suefrantz, and give them a password to get in. Your mobile experience may vary. I tried connecting to the shared screen using Chrome on my Android tablet, and all I got was the main Same.io page. The developers are actively working on this product, so look for new features in the coming months. TeamViewer is the easiest, most reliable (for me) and it’s free. Hey, another very good alternative is RHUB`s web conferencing servers. It works well.